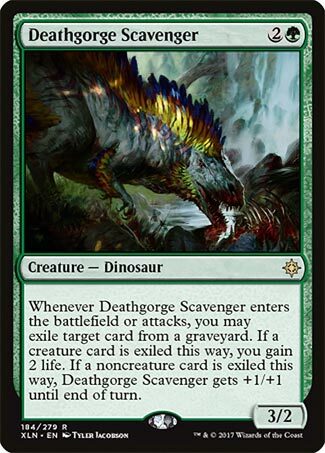 Deathgorge Scavenger isn’t very exciting at first glance. In a vacuum its abilities aren’t as good as Scavenging Ooze and its stats aren’t very impressive nor does it really synergize with Dinosaur tribal. 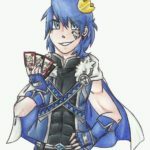 That is until you remember that the last block was graveyard focused. Between Torrential Gearhulk, God-Pharaoh’s Gift, and Azcanta all seeing tournament play, adding some graveyard hate isn’t a bad idea. That being said, I feel like Sentinel Totem is the better option for pure graveyard control. If you have a way of giving it haste, swinging for with a 5/4 for 3 mana is pretty good. Much like a certain Ooze we all know and love, Deathgorge Scavenger hits graveyards early and often. What it does with graveyards is slightly different, but it’s good all the same. The crux of the Scavenger is its trigger, happening when it enters the battlefield or attacks. You can exile a card from either graveyard, gaining life for a noncreature and buffing it for a creature. This means it will often attack as a 4/3, but you also have the option to gain 2 life with each swing (or when it hits the field; a 3/2 for 3 that gains 2 life is certainly a fair deal). This has the upshot of wrecking graveyard synergies and effects, and it’s a good way to try and mitigate recursion. It is weaker than Scavenging Ooze in that you can’t turn a flood of mana into a graveyard buffet, and its buff is impermanent, but it’s potent all the same. I think aggressive decks will like this card; they’ll oft have the ways to fuel it, and it’s a reliable threat that can help put the game out of reach for your opponents.